Tokyo Game Show 2013: Happy Photo Funtimes! NVC: Let's Talk About Tokyo Games Show! Link's past is coming back to haunt him. 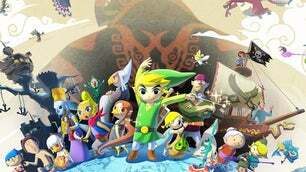 Since the launch of the Nintendo 3DS last year, and particularly since Ocarina of Time 3D hit store shelves, fans have been asking what's next in the Zelda franchise's portable future. Nintendo has given three distinct signals in this regard - a remake of Majora's Mask, a sequel or remake of A Link to the Past, or something completely original. All three options have seemed vague - mere thoughts in the larger scheme of considerations facing Nintendo. During a recent interview with Shigeru Miyamoto, we found ourselves with a slightly more concrete answer. It turns out that Nintendo is weighing two distinct ideas at the moment - the remake of Majora's Mask or something involving A Link to the Past. "We haven't quite decided yet, whether we're going to do A Link to the Past, because there's also the possibility of doing a remake of Majora's Mask," Miyamoto told me in an interview at E3 last week. "This is something we've certainly been talking about and doing a little bit of experimenting with, to figure out which way we're going to go." Miyamoto noted he couldn't announce anything at that time, and said Zelda fans around the world would have to wait "just a little while longer" for any concrete answers. However the legendary designer, and current co-director of Nintendo's development efforts (the other being Takashi Tezuka - read my Mario interviews with him here and here), put these Zelda-related interests in the larger context of the forces demanding the company's attention. "We have so many goals right now," Miyamoto said. "We're always looking at expanding our audience and giving people the opportunity to get their hands on 3DS and see what kind of fun gaming experiences they can have. And now, we're also tasked with pushing the Wii U. So we have lots of good opportunities in terms of thinking about which Zelda game is going to be best for which purpose." Which game will serve which goal? The two Zelda concepts couldn't be further apart. Majora's Mask is widely regarded as one of the more complicated, dense entries in the saga - something it is celebrated for. Meanwhile A Link to the Past remains one of the pinnacles of the action-RPG's 2D efforts, and is still in contention for the title of "Best Zelda Game" in the minds of many fans. Nintendo is deliberating which route to take. During our interview, Miyamoto asked which game the IGN Nintendo team would like to see, which split us - two (Audrey and myself) for A Link to the Past, with one (Sam) for Majora's Mask. This is clearly something that fans could influence. So the real question is - what version do you want to see? Rich is an Executive Editor of IGN.com, the leader of the Nintendo team and the master of all things Assassin's Creed, Resident Evil and WWE. Follow him on Twitter. Follow him on IGN. Follow him everywhere but the SF trains. That be creepy, yo.